HE'S NOT FLASHY, or mean, or so abrasively partisan he can't do business with Democrats. He has domestic political and foreign policy experience. He knows Congress and the White House because he has served in both branches. And he can be tough when called for. And he's loyal. 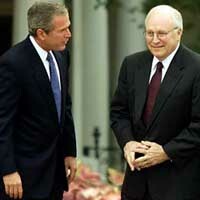 Cheney is not much of a debater, said Wallop, and "not a dazzler, but he's a solid rock of integrity and competence. ''Wallop implied that if the campaign is about who is more trustworthy, Bush-Cheney will win in a landslide. Cheney's last foray into presidential politics came four years ago when he was a senior strategic advisor to the Dole campaign. Contrasting the Clinton-Gore administration with Dole, Cheney asked, "Do we want to elect a president with a clear understanding of foreign affairs, or one who stumbles from one international crisis to the next? ... Do we want to elect the better man for America, or settle for an incumbent who has failed to live up to his promises?'' We know how the voters answered those questions. Cheney is a nice guy who will be hard to demagogue and demonize, though Democrats will certainly try. Look for them to claim that Bush the younger had to reach back to "Poppy's'' men for mature leadership, implying that Bush can't lead. But Bush can lead. He's done so as governor of Texas and now with a solid pick for a running mate. Bush has often said that his vice presidential selection wouldbe the most important decision he makes this year and will tell people a lot about him. It is and it has. Bush-Cheney may not be exciting, but after what this administration has put the country through for eight years, we could all use a little rest and some serious men with integrity in the White House.